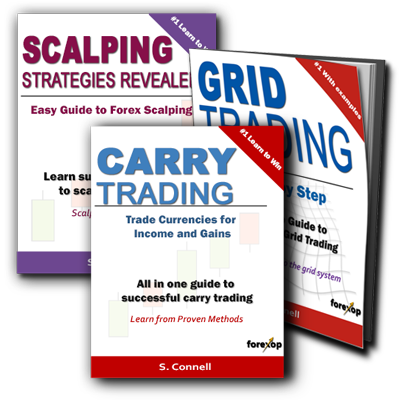 The three-inside is a chart pattern for predicting trend turning points and swings in currency pairs and other markets. It’s not common, but it’s worth looking at as the stronger arrangements tend to be fairly reliable in predicting short-term movements. The “3-inside” is actually just an extension to the harami pattern. The harami is a 2-bar pattern whilst this is a 3-bar pattern. It therefore provides an extra confirmation that a trend turning is taking place. As with other candlestick signals, when trading them we often have to deal with increasing volatility when reversals are underway. There are two variants to this pattern. The “three-inside up” is a bullish pattern as it signals a potential bullish reversal of a downtrend. By contrast the “three-inside down” signals a possible bearish reversal in the market. As with any technical indicator, false signals can be quite common. Therefore the context surrounding the pattern’s formation plays an important role in its interpretation. This should always be considered before placing any orders. 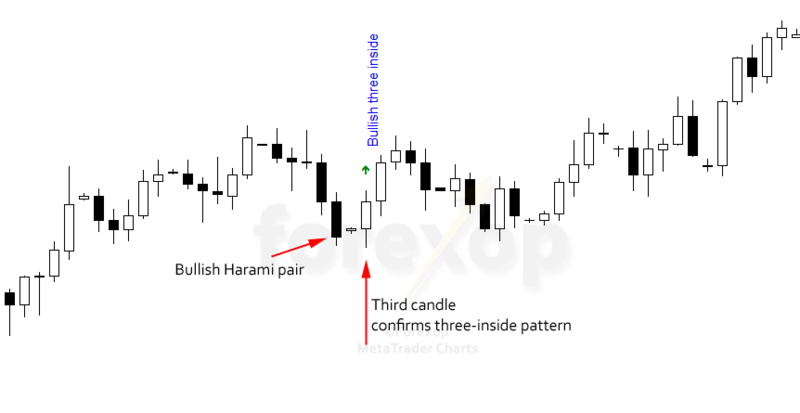 With the bearish pattern, the first two candlesticks form a bearish harami. This means the second candlestick is small relative to the first and it forms entirely “inside” it. See Figure 1. That is the top and bottom of the small bar are below and above the top and bottom of the previous bar respectively. For a strict harami, the inside bar should be the opposite color – although some traders do relax this constraint. The third candlestick must be bearish and should close below the open (or the low) of the first candlestick. This confirms the pattern. The bullish three-inside is the opposite arrangement. The third candlestick is white and follows a bullish harami pattern. Again, the third candlestick confirms a valid three-inside and that should close above the open of the first candlestick. If we examine all harami patterns across currency pairs, the 3-inside arrangement occurs in only about 20% of them. With the other 80% of patterns, the third candlestick either doesn’t provide a clear confirmation or it moves the other way. That means the 3-inside is not a very common pattern, at least on the daily chart. On that timeframe we typically only see three or four occurrences each year. But the stronger patterns tend to have relatively good predictive ability, so it’s worthwhile to take note of them when they appear. This pattern is more likely to appear in short duration swings rather than in major trend turning points, simply for the reason that these are more commonplace. The swings also offer easier trading opportunities than trying to time the reversal of a major trend. We prefer to go long in an upwards trending market by trading the downswing. Or we go short in an downwards trending market by trading on the reversal of the upswing. This first example shows a bearish 3-inside pattern occurring in a downtrend on the EURUSD hourly chart. The first candle in the pattern is labelled 1 and begins a bearish harami. 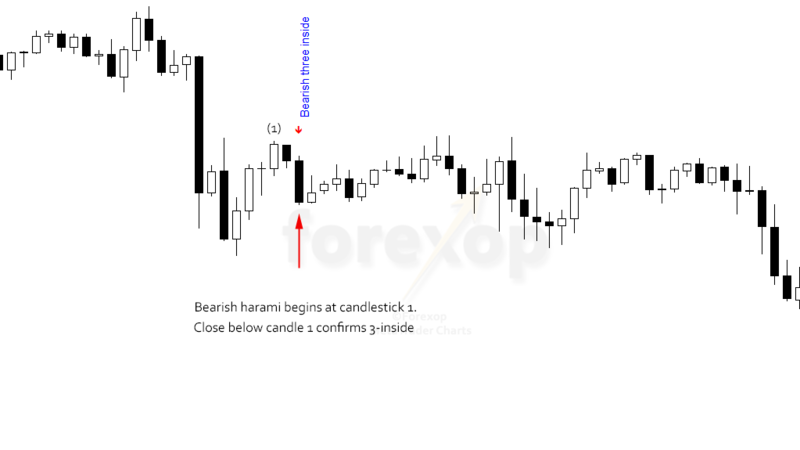 Breaking down the pattern, candlestick 1 is a bullish white candle, and this is followed by a black candle that’s enclosed entirely within it – it’s a weak harami. This occurs not at a trend top but rather during an upward swing in an otherwise downwards trending market. The harami suggests indecision and weakening upward momentum. The third candlestick in the pattern is then bearish and it closes well below the low of the first candlestick. So this 3rd candlestick completes a bearish “3-inside” pattern. Notice that after the 3-inside, there’s a small kick-back as the market retraces upwards again temporarily. The fundamentals for EURUSD are weak though at this point in time and the bullish upswing doesn’t gather enough strength to pull in enough momentum buyers. It’s usual to see some higher volatility around these swings and turning points, so we need to take that into consideration when placing orders and deciding stop-losses. However, the 3-inside is a short-duration reversal signal, so we generally don’t “chase the market” if it goes the other way. Stop losses are kept fairly tight. This setup on the USDJPY daily chart shows an almost exact opposite of the above example. This bullish 3-inside pattern appears in a brief downswing in an otherwise upwards trending market. The downswing loses momentum and we see some evidence for that in the strong bullish harami. This begins at the long black candlestick marked with the first red arrow. This is followed by a shorter white bar that’s entirely inside its predecessor – a bearish harami. This gives us some indication that the downswing is losing momentum. The third candlestick in the pattern is bullish. This closes just above the high point of the first candlestick, so this completes a bullish three-inside. We then see the market trending upwards again before another brief downswing appears.